The DC All Stars panel on the Main Stage at the Javits Center was not a place to be for breaking news or insights into coming comic events. Rather it was a chance to hear from DC’s “all stars;” creators at the top of their game making quality content for the company and it readership. 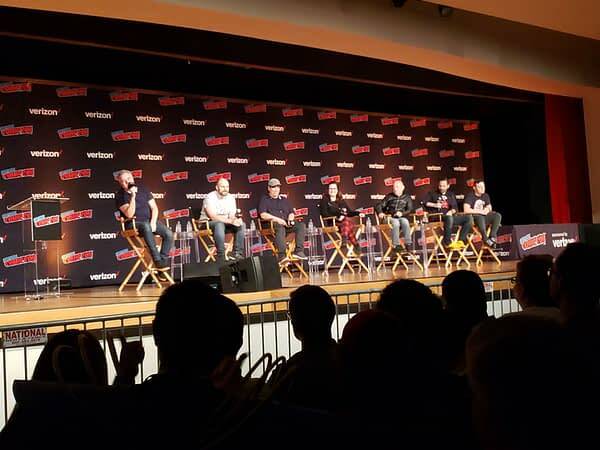 DC Publisher Dan DiDio introduced the panel which consisted of Jock, Tom King, Jimmy Palmiotti, Amanda Conner, Brian Bendis (who was an announced addition), Sean Murphy, and Scott Snyder. DiDio served as master of ceremonies and led the assembled artists and writers through thoughts, feelings and anecdotes about living, and making it in, the industry (and in particular DC). The lighthearted affair allowed for some entertaining comments and anecdotes. Amanda Conner spoke of her time at the Joe Kubert school, as a former comics retailer, and ultimately shared that her ambition as a child was to be a lion tamer. 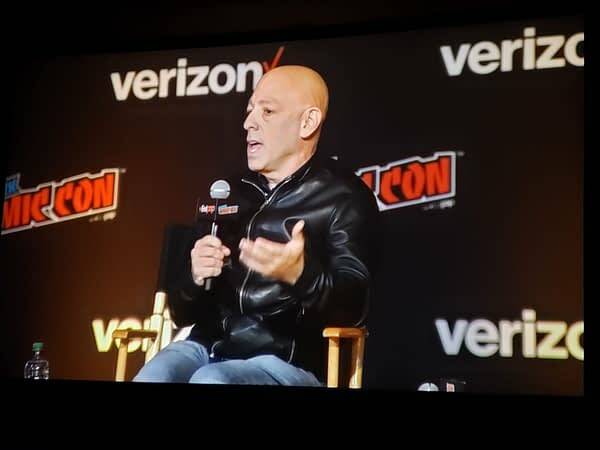 When asked by DiDio about whether it was a struggle rising through the industry ranks as a woman, Conner did not bite. “Here’s what Joe Kubert was telling us…comics are the hardest thing to get into… [so] I just assumed it was hard for everyone and I expected it to be hard… I just saw myself as a comic artist.” She did then accept the praise offered by Bendis for her role helping to “pave the way for women” in the industry. The event closed with panelists relating their experiences at cons in the past. Bendis related how Walt Simonson changed his life at a con by taking the time to look at his work and advise him – even staying in touch with him for years after. Tom King shared a story about being disappointed by a bad con interaction with Roy Thomas when he was younger and how angry it left him. He expressed an appreciation that fans fome to cons to interact with creators.